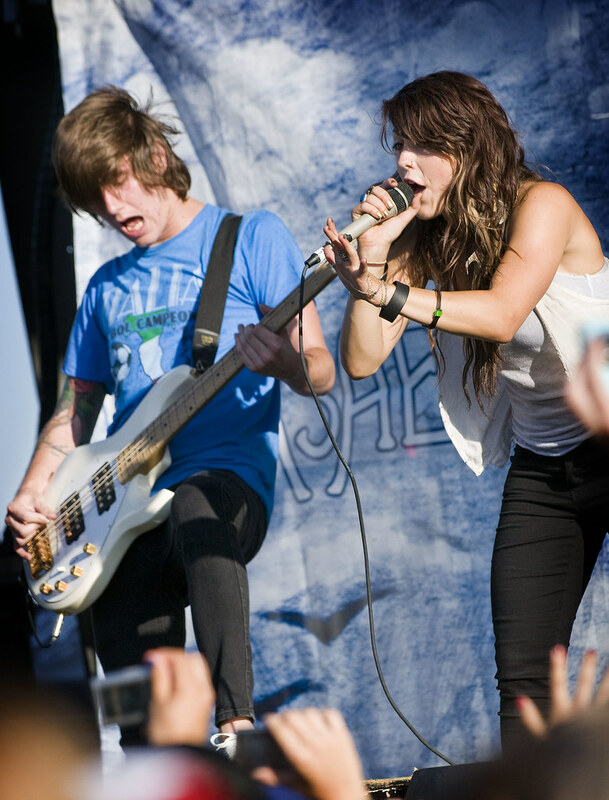 VersaEmerge (FL) hits the frantic festival tour this year through North America via Hoodwink Festival 2010, The Bamboozle, and now streaming full wind to the end of Vans Warped Tour Twenty Ten. The band is out to recruit new fans into their vulture core with their full length debut album “Fixed At Zero” released by Fueled By Ramen (the same label as Paramore). But it is more than just getting the album. Those that pre-order the album at the VersaEmerge merchandise booth will receive a special limited edition laminate, signed by each band member! The collector’s laminate will also have a code for digital album download with bonus tracks (which is much more convenient than holding a CD case all day getting crushed in the crowd). It is also a pass that gives access to merch booth discounts and a cut-in-line at Warped Tour signing sessions. More music, more stuffs, more autographs, and if you are lucky, grab down a promo poster found around the festival and throw it up to show support while crowd surfing, and who knows, you might just get it autographed as well. As for their live performance on the Glamour Kills stage this year, it is one not to miss if you are any bit of a fan for the band. There is much insight to their performance that devotees will recognize while others just scratch their heads and flow with the fun. For instance, the strange long feather dangling from her hip may seem out of place, but the screamers smothered across the stage barricade know it is all about the vulture crew. Followers talking with their fingers throw up the Fixed At Zero VersaVulture eye giving their leader, lead singer, Sierra Kusterbeck, a vulture grin and the adrenaline to unleash her soaring vocals to its threshold and beyond. She becomes her own fan on stage, giving a genuine pumped performance, with a few bump and gun mishaps, that together, reveal a delight and purity that connects her to her wake of vultures and makes others turn into supporters. A professional sound, yet lively, good willed, type of band devoted to their fans. The new album is only a hint to the fascination one can have with VersaEmerge. Get involved. It's marvelous. Feather hair clip anyone?